Spanning 900 miles of the Great Plains between the United States (Missouri) and Mexico (Santa Fe), this great trail of commerce between two countries was also a route for the frontier military and emigration to the West. For 60 years, the trail was one thread in a web of international trade routes. It influenced economies as far away as New York and London. The 1865 close of the Civil War released America's industrial energies and stimulated the push to develop railroads westward. Railroad expansion gradually shortened the Santa Fe Trail — finally replacing it in 1880. 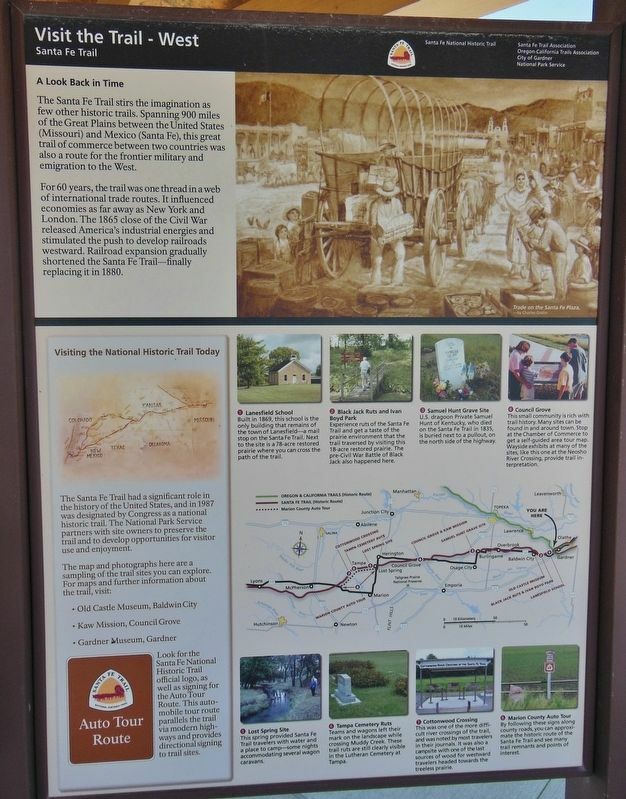 The Santa Fe Trail had a significant role in the history of the United States, and in 1987 was designated by Congress as a national historic trail. The National Park Service partners with site owners to preserve the trail and to develop opportunities for visitor use and enjoyment. Look for the Santa Fe National Historic Trail official logo, as well as signing for the Auto Tour Route. This automobile tour route parallels the trail via modern highways and provides directional signing to trail sites. Built in 1869, this school is the only building that remains of the town of Lanesfield — a mail stop on the Santa Fe Trail. Next to the site is a 78-acre restored prairie where you can cross the path of the trail. Experience ruts of the Santa Fe Trail and get a taste of the prairie environment that the trail traversed by visiting this 18-acre restored prairie. The pre-Civil War Battle of Black Jack also happened here. U.S. dragoon Private Samuel Hunt of Kentucky, who died on the Santa Fe Trail in 1835, is buried next to a pullout, on the north side of the highway. This small community is rich with trail history. Many sites can be found in and around town. Stop at the Chamber of Commerce to get a self-guided area tour map. 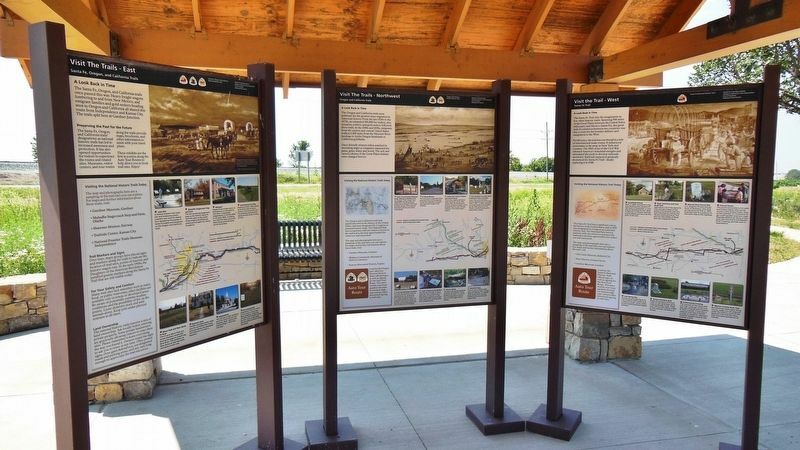 Wayside exhibits at many of the sites, like this one at the Neosho River Crossing, provide trail interpretation. Teams and wagons left their mark on the landscape while crossing Muddy Creek. These trail ruts are still clearly visible in the Lutheran Cemetery at Tampa. This was one of the more difficult river crossings of the trail, and was noted by most travelers in their journals. It was also a campsite with one of the last sources of wood for westward travelers headed towards the treeless prairie. By following these signs along county roads, you can approximate the historic route of the Santa Fe Trail and see many trail remnants and points of interest. Location. 38° 47.786′ N, 94° 57.703′ W. Marker is in Gardner, Kansas, in Johnson County. Marker can be reached from the intersection of U.S. 56 and West 183rd Street, on the right when traveling west. Touch for map. This marker is the rightmost (west) panel of a three-panel marker kiosk near the parking lot at Gardner Junction Park. Marker is at or near this postal address: 32505 West 183rd Street, Gardner KS 66030, United States of America. Touch for directions. are within 2 miles of this marker, measured as the crow flies. A different marker also named A Look Back in Time (here, next to this marker); a different marker also named A Look Back in Time (here, next to this marker); Eye of the Needle (within shouting distance of this marker); Following Their Dreams (within shouting distance of this marker); Apprehension and Conflict (within shouting distance of this marker); From Prairie Schooners to Locomotives (within shouting distance of this marker); Overland Trails (approx. 1.9 miles away); The Herman B. Foster Home (approx. 1.9 miles away). Touch for a list and map of all markers in Gardner. Credits. This page was last revised on March 24, 2019. This page originally submitted on March 24, 2019, by Cosmos Mariner of Cape Canaveral, Florida. This page has been viewed 63 times since then. Photos: 1, 2, 3, 4. submitted on March 24, 2019, by Cosmos Mariner of Cape Canaveral, Florida.